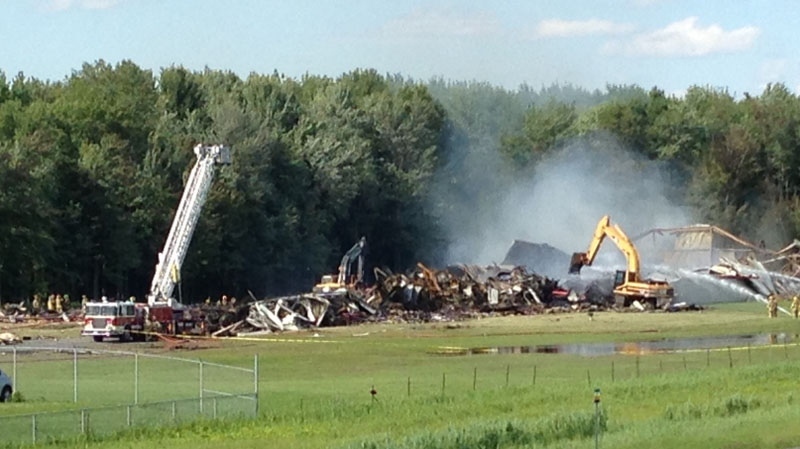 Authorities were removing bodies from the wreckage late Thursday afternoon after two female employees were killed after an explosion laid waste to a fireworks store near Highway 20 in Coteau du Lac. Emergency crews rushed to the scene around 9 a.m. when the blast rocked the area, with residents several kilometres away seeing a large pillar of smoke rising from BEM Fireworks. Three hours later they found the bodies of two people in the charred wreckage of the several buildings that had been destroyed, either by the initial explosion or in subsequent fires. Following the blast police immediately evacuated the area in a one-kilometre radius, affecting people on the south side of Highway 20 near the St. Emanuel exit, and closed all traffic on Highway 20 and a nearby railway line. Those closures are affecting car and truck traffic between Montreal and Toronto, and has stopped a passenger train between Quebec City and Ottawa. "It is a massive plume of smoke we can see at the horizon -- thick, black smoke rising up from the ground, so this is a massive explosion that happened," CTV reporter Derek Conlon said. Residents living nearby were surprised by the blast. "I was in the bathroom and I heard a tremendous boom like an earthquake," said Nicole Lecompte. "I went outside and I could see black smoke, and the five or six warehouses, like trailers, they were gone." More than three hours later fireworks could still be heard exploding at the scene of the fire and firetrucks were arriving from neighbouring municipalities. Multicoloured clusters popped above the rest of the thick, dark smoke emanating from the blast site, located near Valleyfield, Que., roughly 60 kilometres southwest of Montreal. The original blast vibrations could be felt for kilometres and the smoke was also visible from neighbouring municipalities. About 150 firefighters, from 14 different departments, were called in. "We got really, really, really scared," said Ginette Liboiron, who runs a convenience store across the highway overpass. "I thought my store was falling to the ground. It shook like you can't imagine... We all went outside to see and saw the big, incredible smoke. "Then the fireworks went off." According to its website, B.E.M. has been designing and manufacturing pyrotechnics and fireworks for 25 years. One area resident said the explosion scared her cats. Another said his dog slammed into a wall. The two panicked felines went scampering under the bed. Madeleine Boucher said she watched the explosion from her window 700 metres away. "It was impressive," she said, joking that the incident would have prettier at night. "Wasn't very pleasant, though... I wouldn't say I was scared for myself, no, but I'd have been scared if I lived closer." Another man, whose dog slammed into the wall, was about to have breakfast with his wife. Roland Desforges says his wife thought the explosion might have been a plane crash or an act of war. But he says he instantly suspected it might be the neighbouring fireworks plant. He says he went to the overpass to get a look. He believes the initial explosion occurred in the middle of three buildings on the compound: in the production plant, which he says is centred between the fireworks store and its storage facility. "In seconds there was nothing left," Desforges, 68, said of the plant. The company occupies a sprawling property near Highway 20 that includes a store and warehouse. According to the Quebec business registry, the company employs between six and 10 people. An investigation into the blast cause is underway. But the provincial government has already expressed some concerns about a lack of fire hydrants near the site. Fire crews struggled to access water as the closest hydrants were on the other side of the highway. The town's mayor, Robert Sauve, justified that absence of hydrants next to a pyrotechnics plant by saying it had been there for 40 years. Provincial Public Security Minister Stephane Bergeron questioned why there would be no effective means of extinguishing a fire so near such a potentially-explosive factory. “We’ll wait to see what the investigators learn, but I can tell you that we’re already quite disturbed. For example there was no water feed anywhere nearby. That made things tricky for the firefighters. We’ll surely learn some important lessons from this sad event,” he said. Bergeron made the comments while at a stop in Montreal with Premier Pauline Marois who offered her sympathies to the familes of the victims. “I’d like to offer my most sincere condolences to the families of those who died and offer our support to the community. It will definitely affect the entire Coteau du Lac area,” she said. The area evacuees were allowed to return home in the afternoon. Liboiron said she has run the nearby store for 37 years and had never worried about being next to the fireworks factory. That indifference went up in a monumental puff of smoke. "It was gigantic," she said. "It went high up in the air, then it became black, black, black." Specialists from a group known as TAGA will be analyzing the air to determine whether aircontaminants spread as a result of the blast. Government officials have said that all necessary measures will be taken to ensure the safety of the environment. Highway 20 was closed in both directions for many hours after the explosion, as debris, including fireworks was removed from both sides of the roadway. Coteau du Lac is a town of about 7,000 residents in Vaudreuil-Soulanges county. It sits approximately 60 km southwest of downtown Montreal. 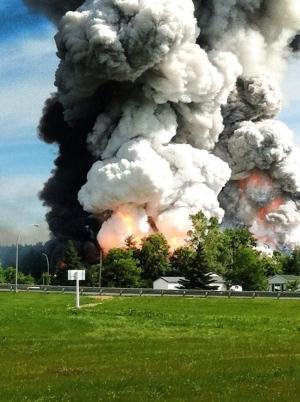 MyNews contributor Liz Rivard captured video of an explosion in Coteau du Lac, Que., Thursday, June 20, 2013.